KICKING OFF GKF! 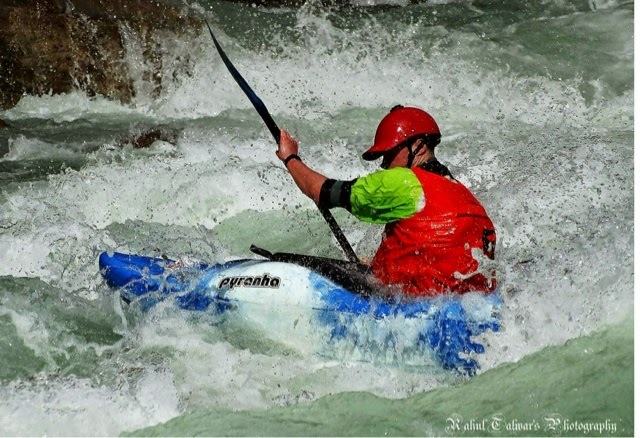 by "Chicago" Mike Toughill | DBP MAGAZINE ONLINE The World's Best Free Whitewater Publication. 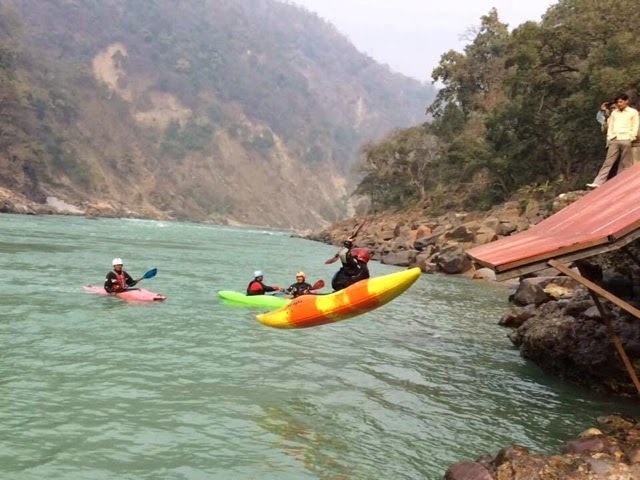 This Monday the biggest whitewater festival in India began, the Ganga Kayak Festival on the Ganga (Ganges) River. 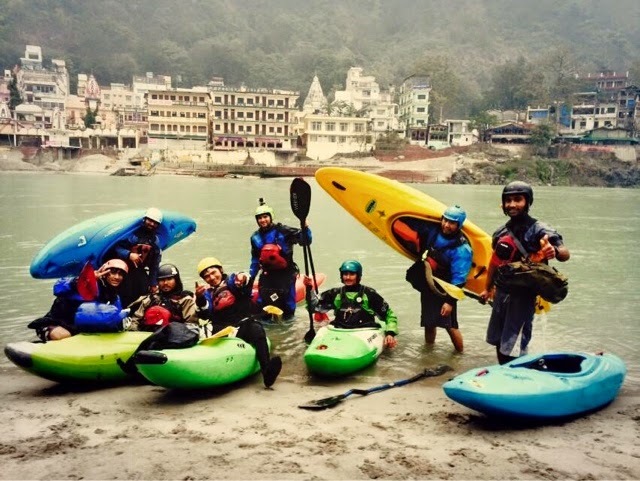 Paddlers from all over the world have been converging at Uttarakhand outside Rishikesh to rage the Mother River and compete in this fun multi-discipline, multi-day event and enjoy one of Asia’s best get-togethers! 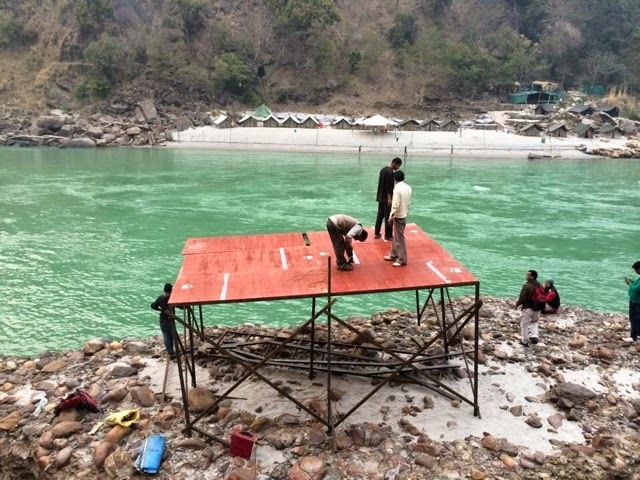 Boaters launched off the newly completed 22 foot kayak ramp, biggest in India, to hit the river. And TEAM 4 ADVENTURE will be assisting Pixeldo http://pixeldo.com/ to provide aerial cinematography to capture a unique view of the action! 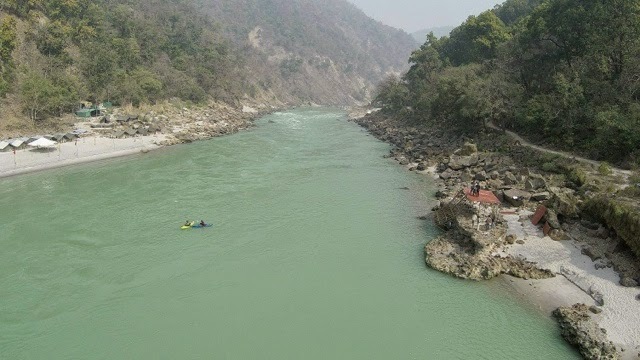 Boaters are enjoying the best beach campsite along this stretch of the Ganga at Camp Rait, the Himalayan Travels location. 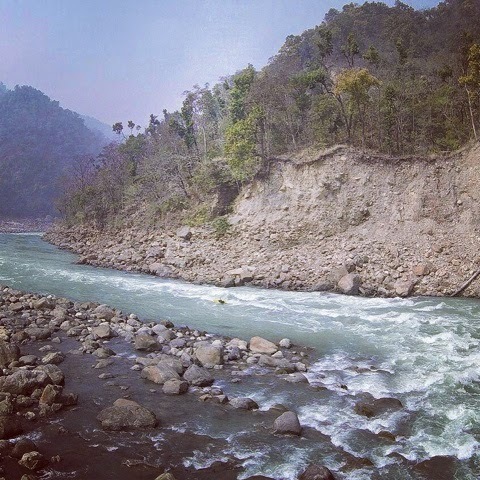 It is an awesome place to host the event, and a beautiful place to take in the majesty of one of the world’s greatest rivers. Sprint (Pro’s): Starts from above the golf course rapid on the river left with a seal launch off the 6mtr high ramp. There will be a compulsory boof on the top center and touch me banner with hand on the river right. To finish the race, the athlete must touch the banner with their hand on the rock in the left eddy below golf course. Each athlete completes 2 laps with the fastest lap time counting. Giant Slalom (Pro’s): Starts from above the golf course rapid on the river left with a seal launch off the 6mtr high ramp. 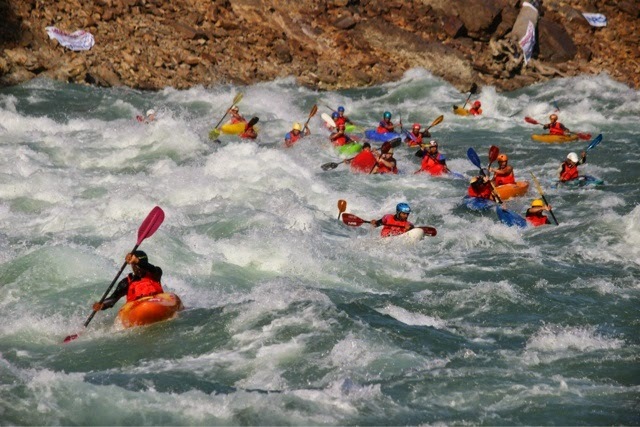 There will be a compulsory boof and several upstream gates on both side of the river. To finish the race, the athlete must touch the banner on the rock in the left eddy below golf course. Each athlete completes 2 laps with the fastest lap time counting. .
Boater cross: The top 32 athletes from the Sprint and Giant slalom events (combined time) will qualify for the pro’s Boater Cross. 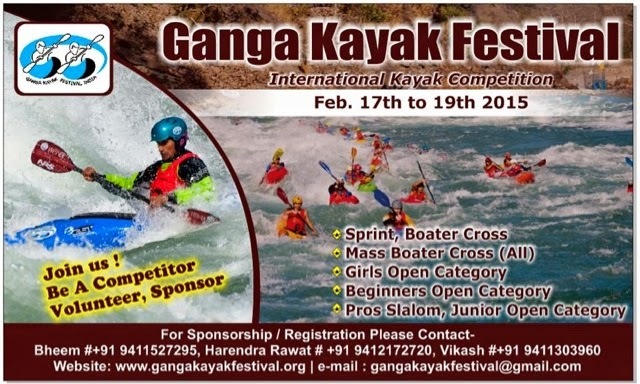 There will be heats of 4 kayakers. Starts from above the golf course rapid on the river left with a seal launch off the 6mtr high ramp. There will be a compulsory boof on the top center and touch me banner on the river right. To finish the race, the athlete must touch the banner on the rock in the left eddy below golf course. The top 2 from each heat will move onto the next round and so on. The top 4 athletes will qualify for the Super Final round and battle for the Boater Cross title. 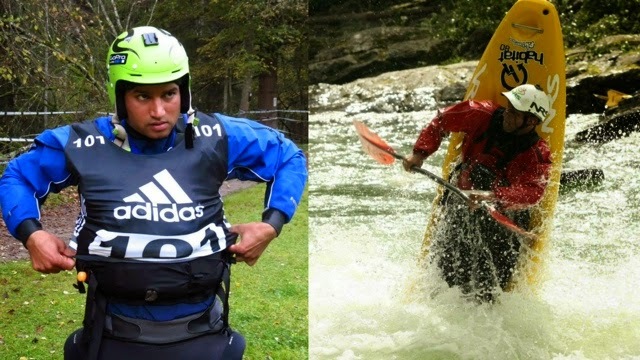 Best Indian paddler of the year award: Top 4 Indian athletes will qualify for this category based on a combined ranking from the Sprint, Giant slalom and Boater cross and will battle for the honor. 1. When the start signal fires the athletes will swim from river right above golf course to river left and get in their kayak on the ramp and sprint down to the finish line (same race course as sprint). 2. Boater Cross super finals (same race course as boater cross). Intermediate/Beginners (Open Category): Starts from above the golf course rapid on the river left with a seal launch off the 6mtr high ramp. Sprint down to “touch me” banner on the river right. To finish the race, the athlete must touch the banner on the rock in the left eddy below golf course. Each athlete completes 2 laps with the fastest lap time counting. 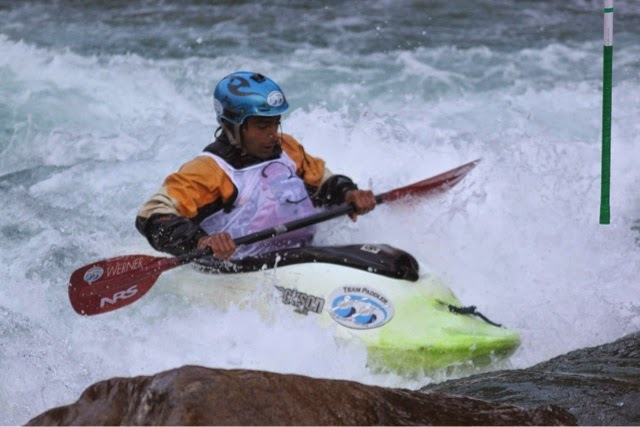 The fastest 4 athletes will qualify for the boater cross super final. Boater cross super final will start with the seal launch from the high ramp all the way to the finish line below Golf Course rapid. There will be no gates for this category. Junior (Open category): Starts from above the golf course rapid on the river left with a seal launch off the 6mtr high ramp. Sprint down to “touch me” banner on the river right. To finish the race, the athlete must touch the banner on the rock in the left eddy below golf course. Each athlete completes 2 laps with the fastest lap time counting. The fastest 4 athletes will qualify for the boater cross super final. Boater cross super final will start with the seal launch from the 6mtr high ramp all the way to the finish line below Golf Course rapid. There will be no gates for this category. Women’s (Open category): Starts from above the golf course rapid on the river left with a seal launch off the 6mtr high ramp. Sprint down to “touch me” banner on the river right. To finish the race, the athlete must touch the banner on the rock in the left eddy below golf course. Each athlete completes 2 laps with the fastest lap time counting. 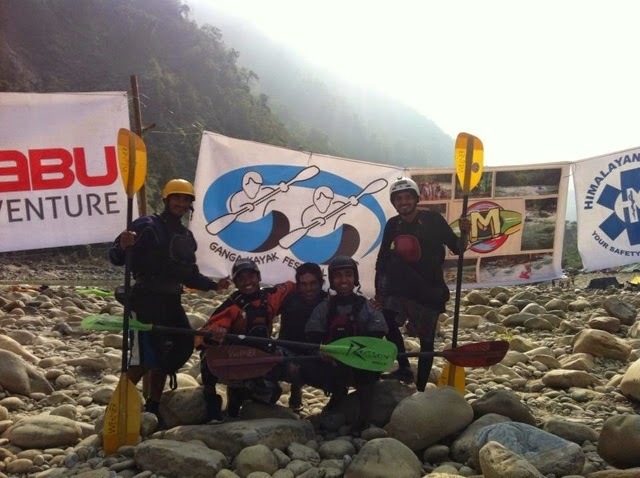 The fastest 4 athletes will qualify for the boater cross super final. Boater cross super final will start with the seal launch from the 6mtr high ramp all the way to the finish line below Golf Course rapid. There will be no gates for this category. Mass boater cross (for all): Athletes will start together from above the Roller Coaster rapid on the river left. It will be a Le-mans style start. Once the start signal fires the athlete will need to run over, enter their kayak, put their spray deck on, and sprint down to the finish point below golf course on the left. This is a 2 km long race and there will be no gates for the Mass Boater Cross. 2. 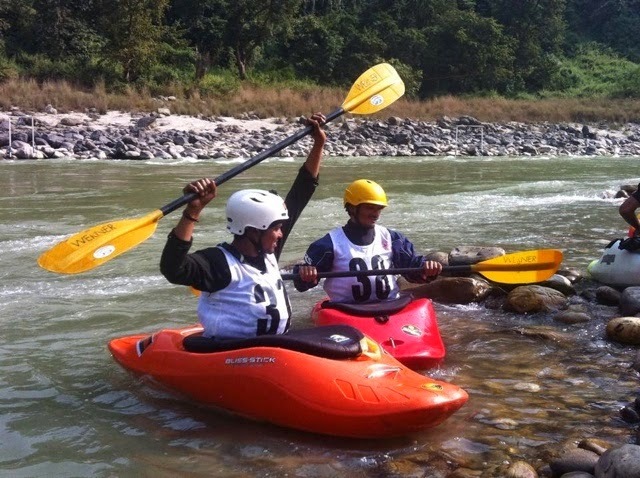 Athlete must be a solid class 3+/4 kayaker and a competent white water swimmer. 5. 50 seconds penalty for missing gates/ obstacles. 6. 10 Seconds penalty for touching gates (on Slalom). 7. 50 seconds penalty for missing gates/obstacles. Games for Spectators – Kayak and SUP & river boards display, throw bag contest, free GKF t-shirts raffles, free bus shuttle, food vendors, movie nights, music, party and much more! Here’s to a safe successful Festival! Cheers to India!